Poi spinning is a type of performance art. It involves using a set of weights on strings. Many people use beanbags in long socks. These are called a set of poi. 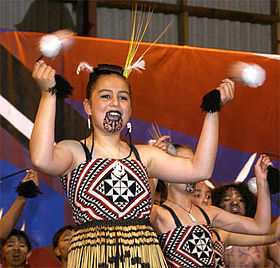 People spin the poi around their body drawing shapes in the air. LED lights or fire is sometimes used to make the poi easier to see and more exciting to watch. This page was last changed on 31 January 2014, at 02:46.